Superb charnel house, 19th century terracotta stone - beautiful patina, beautiful condition without hole or fel - n ° 1. 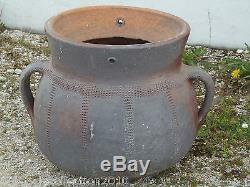 Height 41 cm - inside diameter 23 cm and outside without handles 36.5 cm. Payment by bank check, bank transfer with iban and bic. The item "charnier ponne terracotta xix superb condition n ° 1 deco garden veranda collection" is on sale since Saturday, October 1, 2011. It is in the category "art, antiques \ objects of the nineteenth and before". The seller is "autempspasse16" and is located in / in poitou-charentes. This item can not be delivered, the buyer must pick it up.